RoofBag Explorer Car Top Carrier: Soft Waterproof Cargo Carrier Fits Cars With Rack. Includes Straps for Car with Racks. • Fits almost any size car. • Needs at least 40 inches of roof length (front-to-back). • Large enough to store 4 medium-size suitcases or their contents. • Dimensions: 40" L x 36.5" W x 10" - 17" H.
• Empty Weight: 8 pounds. • Fits mid- and large-size SUVs, some Compact SUVs, Full-Size sedans, Large Vans, Mini Vans, Station Wagons. • Needs at least 48 inches of roof length (front-to-back). • Large enough to store 5 medium-size suitcases or their contents. • Dimensions: 48" L x 38" W x 11" - 18" H.
• Empty Weight: 9 pounds. Save fuel with RoofBag's aerodynamic shape. For best fuel savings and a quiet ride, front of RoofBag carrier should be at least 8 inches behind the front edge of the roof. 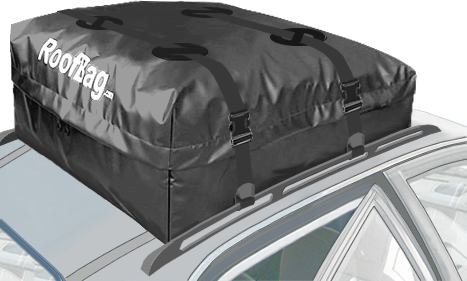 RoofBag Explorer cartop carriers offer excellent weather protection at an economical price. The front corners of the RoofBag Explorer carrrier are electrically welded, for best water protection in the area where water penetration is more likely. However, the zipper flap and the rear corners on the RoofBag Explorer carrier are sewn, as opposed to welded, for a more economical construction. The stitching on the RoofBag Explorer presents the potential for minor water wicking through the needle holes in heavy rain. Choose RoofBag Explorer carrier when heavy rain is not likely, or when the contents of the car top carrier can be shielded from the zipper area. For more complete water protection, choose RoofBag Cross Country carrier model, which is built with all joints (front corners, rear corners and zipper flap) electrically welded. RoofBag Explorer carrier comes with 2 Pass-Through Straps for use on cars WITHOUT roof rack if you select a car top carrier for a car with no rack. Alternatively, the RoofBag Explorer carrier comes with 2 Rack Straps for attachment to a roof rack if you purchase a car top carrier for a car with rack. Straps are heavy-duty, seat-belt type, 1.5 inches wide, and include two heavy-duty side-release buckles per strap, to provide length adjustability and easy access to the roof top carrier's contents. Straps are also water-repellent, so they won't wick water and won't get soaked. Pass-Through straps are installed passing through the inside of the car with the doors open. Once the straps are installed, the doors close over the straps without interference. The length of each Pass-Through strap can be adjusted at either of the two side-release buckles. The maximum length of each Inside Strap is 12 feet. Rack Straps are also adjustable and attach to side rails or cross bars by a slip knot created by passing the buckle through a loop sewn at the opposite end of the strap. Click here for installation options and instructions. • Welded + stitched - The front corners and strap guides at the top are electrically welded for maximum water-proofness and strength. The zipper flap is sewn and not welded for a more economical construction. This presents a slight chance of minor water wicking through the needle holes above the zipper. • Fully waterproof fabric - Heavy-duty, 18-oz, double vinyl-coated polyester is also resistant to extreme cold, heat, abrasion or ripping. This is the same fabric used in the top-of-the-line RoofBag Cross-Country carrier. • Zipper tape is waterproof - Water cannot enter through the zipper tape. However, water may enter the carrier through the narrow gap between the two zipper tapes. This is prevented by keeping the zipper flap pointing down all around the carrier. A full carrier automatically keeps the zipper flap pointing down thus fully protecting zipper from rain. When using a half-full carrier, strap the carrier so that the zipper flap points down all the way around, to keep water from entering zipper. • Easy access to contents - Zipper runs along 3 sides of carrier and has 2 pullers, making it easy to open the carrier and lift the top for easy access to contents. • Keeps contents dry in all weather except for very heavy rain. • Heavy-duty straps are stronger than they need to be. Straps are water-repellent (will not absorb or wick water), 1.5 inch-wide seat-belt style, and are tested to 1,000 pounds. Two heavy-duty buckles per strap allow length adjustability and easy access to contents. • Quiet ride and fuel-efficient - Thanks to RoofBag's aerodynamic shape. The material used in the RoofBag car top carriers is 18-oz, heavy-duty tight-knit polyester fabric, coated on both sides with a special vinyl formulation that allows our carriers to withstand the severe rigors of travel: extreme temperatures, beating by high-speed wind, and continuous exposure to the elements: sun, rain, snow, sleet, sand or dust. In addition, our special vinyl formulation is UV-resistant so the carriers won't fade or weaken with continuous exposure to the sun. The material is also mildew-resistant, so that nothing grows on it even if stored wet for a year. The material is also fire retardant, so that in the event of a fire the bag itself won't help fuel the fire. Because of our attention to quality in the design and during the manufacturing in our factory in San Diego, California, we can guarantee all RoofBag car top carriers for 2 years. We are confident that our roof top carriers will provide many years of enjoyment.